There’s a lot of noise in our social media channels. I’m busy clogging up your Twitter feed with my deep thoughts, your friends are sharing their millionth baby picture on Facebook, and Scoble is filming startups in your living room on Google+. There is an unfathomable amount of data being produced every second, as social networks, apps, chat, etc. now facilitate real-time communication and sharing — making email feel like the Pony Express. This makes it nearly impossible for people (and their businesses) to stay on top of — among other things — the real-time communication happening between their customers. What’s more, sharing has really gotten out of hand. The ease of real-time communication and sharing has now outpaced our ability to filter the noise into non-teeth rattling signals. There are hundreds examples of real-time data interpretation applied to outputs of noise, and social media dashboards are the answer to the social sharing part of the problem. We just covered Nimble, a company that’s essentially taking on Salesforce with an enterprise equivalent of social CRM for the little guys, i.e. startups and SMBs. Bottlenose today released their own v2.0 of their intelligent social media dashboard, and it’s an interesting and more visual alternative to Nimble. MG covered Bottlenose last year when the company was still in stealth mode and was just focusing on funneling Twitter streams. Co-founded by Nova Spivak, who’s already become known for his data plays, like Twine and Live Matrix, and Dominiek ter Heide, Bottlenose now filters Twitter, Facebook, and RSS, creating a unified stream that puts those networks in one place. The goal, though, is not only aggregation, it’s about understanding what each message is about at a granular level so that it can build a robust profile about you and your interests to help you discover relevant information you might have missed, new friends, articles, and so on. Just like Nimble. The cool thing about Bottlenose is that it gives you the opportunity to set sophisticated alerts and uses action-based rules to help you get on top of the noise, regardless of whether or not you’re actively engaged in the app or not. It can even take actions for you, like a helpful browser-based social media butler. This is all part of Bottlenose’s core technology, called Sonar (hence the dolphin references), which has been significantly improved in version 2.0, now representing a really interesting, visual browsing experience. When you’re in the app, Sonar takes up the right portion of the screen, presenting personalized, relevant tags in a graphic layout. They’re layered in concentric circles, with those closest to the nucleus being the most important, but you can see the visual tree layout of your conversations, clicking into each one to learn more. Beyond the new column view with “Assistants,” Bottlenose 2.0 also now allows you to consume pictures, video, and read articles in-line within your streams (all embedded in the UI), and there’s more author and message context so you can view author data inline, threaded conversations, bios, and so on. Users can also now write lengthier messages, and Bottlenose will carry messages that exceed the character limit into a “metadata payload” that others can expand. Oh, and there’s plenty of Twitter info to keep you occupied, influence, interests (all semantically inferred) — instant dossiers on the people you care about. Hooray! Bottlenose already has 10K+ users in beta, with 100K more on the wait list, and the team says that users have been spending an average of 11 minutes in the app per visit. The startup will be opening up third-party developer access (APIs) very soon to enable plugins, new functionality, integrations, and all that good stuff. 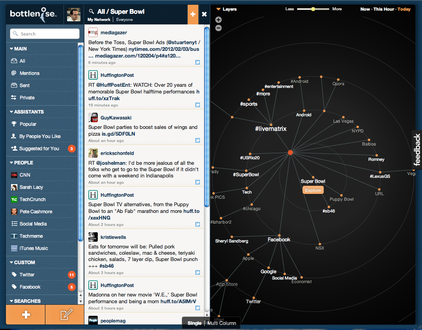 Once that happens, Bottlenose could really take off. The app is still in somewhat limited beta, but for those looking to get access (I recommend checking it out), head over to the homepage, sign up, create an account, and if you’re prompted, use “Getsonar” for the access code. Oh, and if you have a Klout score over 30, you’ll get in automatically. Let us know what you think.